Work from Home Jobs – Customer Service – Part-Time – $11+/Hr. Direct Interactions is hiring part-time Customer Service Representatives for Parking Information & Enforcement. 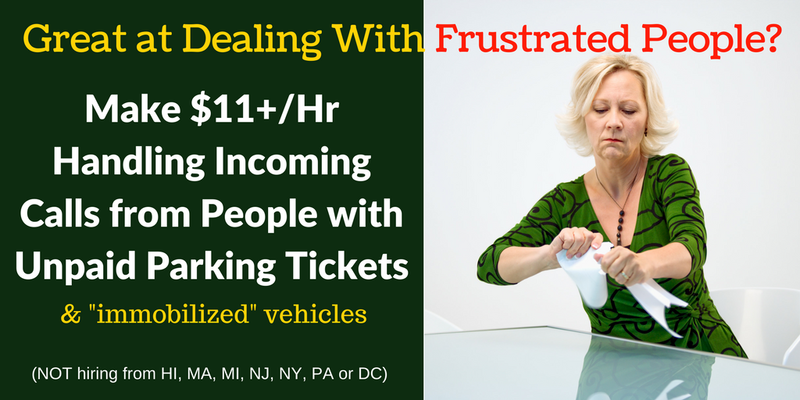 In this role, you will be handling a high volume of incoming phone calls from motorists with unpaid parking tickets. In the case of unpaid parking tickets the motorists’ vehicle has been immobilized and they must contact the call center and pay to mobilize their vehicle. Agents on this program have the ability to remain calm, cool and collected in stressful situations while providing accurate information to upset callers. Agents must be able to handle and resolve customer complaints. Note: According to their site, they are currently NOT hiring in HI, MA, MI, NJ, NY, PA or DC. If your state is on the list, please see our Daily Jobs & Gigs page for more jobs! Shifts: Program hours are currently 24 hours a day, 7 days per week. Agents must be available 30 hours each week Monday through Friday between 4am and 7pm Pacific Time due to Client demand.. More availability is welcome and additional hours may be scheduled at the discretion of the Client Services Director. Actual hours scheduled will depend on client needs, agent performance and adherence to schedule. Be knowledgeable of HelpCenter policies and software- CRM, phone system etc. At least 1 year experience in a high stress call center environment (brick and mortar or virtual). Examples include: Collections, 911 dispatch/operator, taking calls for fraud line, roadside assistance. Please note that a landline phone is required. Computer literate and knowledgeable of e-mail and Microsoft Windows. Agents are responsible for maintaining and troubleshooting their own computers. For more detail and to apply for the job, click here. For the company’s FAQ page, click here. For more jobs like these, check our Newest Jobs & Gigs page. To be the first to hear about jobs like these, like our Facebook page and check your feed for our posts. May you be working from home soon! This entry was posted in Hiring Companies, Work at Home Jobs and tagged Direct Interactions. Bookmark the permalink.